It was in 1996 that Tom Cruise dangled on a wire above bright white pressure plates in the "original" Mission: Impossible, the quasi-remake directed by Brian De Palma. Many of its storytelling facets may not hold up well against the test of time, but the derring-do involved with that sequence -- as well as the consistent energy of the action throughout -- has kept the rebooted version of the franchise embedded in popular culture. Almost as if a competition, Cruise and his team of producers and directors seem compelled to one-up the nature of the action in each one, ever pursuing the next bold scene that might overtake the one from the ‘90s that brought it into the spotlight. Since, Cruise himself has dangled off planes, crawled up the side of Dubai's tallest building, and leapt off more high-up surfaces that one can count, finding ways of performing his own stunts in hopes of pushing his now-‘50s body for his fans' entertainment. The latest M:I installment helmed by Christopher McQuarrie, Fallout, also impresses on that front, but in a largely more cohesive, spread-out and nonstop approach. Also written by McQuarrie -- whose Cruise-driven screenplay credits range from adapting the brilliant Edge of Tomorrow to the dismal reboot of The Mummy -- Fallout follows a few years after the events of M:I - Rogue Nation, during which its central terrorist organization has reorganized into a new group, the Apostles. They're chasing a series of nuclear weapon cores (or pits) that they fully intend on detonating as a fanatical rebooting of the world's order, instead of using them for mere intimidation, a continuation of previous conflicts that Ethan Hunt and his off-the-books organization, IMF, must obviously accept as their next mission. When certain elements of the retrieval mission get away from Hunt and his team of old and new allies (Simon Pegg's Benji and Ving Rhames' Luther), the CIA steps in and insists that one of their own, Henry Cavill as August Walker, accompany them on further pursuits of The Apostles. With him, Hunt and IMF must ensure that the creation and detonation of those bombs doesn't happen. Yes, each installment in the Mission: Impossible franchise takes shape as vehicles for wild blockbuster action, but with the arrival of Brad Bird's Ghost Protocol also came a degree of compelling scriptwriting that elevated Hunt's escapades, if modestly. Fallout feels like a step back in that regard: the aptly-titled sequel relies heavily on old relationships and conflicts to grease up the moving parts of an exciting, well-paced, yet mundane plot of hunting down nukes and ferreting out potential moles from within the operation. There's joy to be had in the conversations with longtime partner Luther and the comic relief of Simon Pegg's toughening bookworm Benji, along with the reemergence of Rebecca Ferguson's once-undercover MI6 agent, Ilsa. At its core, however, Fallout comes across as if it needs to double as a possible sendoff for Cruise's Hunt and the franchise through its cobbling together of old concepts and reunion of familiar faces, more of an endgame and less of an evolution of the series' story potential. There's an unmistakable comic-book caliber of anarchy behind what's being orchestrated by The Apostles -- even Lane has a bit of a Dark Knight Joker villainous aura about him -- and as a result Fallout follows an undemanding path toward nukes, espionage, fake-outs and high stakes. 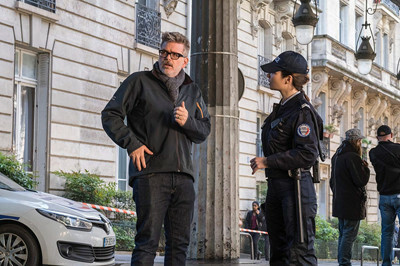 But, in the vein of some of the series' other installments, that's enough of a framework to keep the gears moving for Christopher McQuarrie and his grasp on action, hurling Ethan Hunt into uncharted peril throughout Paris, London, and the mountainous reaches of Asia. From the start, the flow of the camera and editing wants the audience to grasp that Fallout's being as candid and personal as possible when tense conversations transform into hand-to-hand brawls and chases, and those blunt objectives of the story turn into assets for the action, allowing key points to guide the momentum so those watching can relish the intensity of what's happening and the personality of the characters caught up in the scenes. While there's another of those "signature" scenes in Fallout that once again happens way, way, way high up in the air and showcases Tom Cruise's daring pursuit for practical action, it doesn't stick out as much as the Dubai building climb or that time when he held on for dear life on the side of a plane. McQuarrie has crafted this film's action in a way that better slipstreams with the plotting, while also telegraphing numerous other set pieces with just as much emphasis on grand scale and practical immersion as the scene that could've become yet another claim to fame. In combination with fierce combat choreography and vehicle chases by land, sea, and air that try to balance escalation and practicality, Fallout maintains a high level of momentum and tension that develops into one of the series' most complete, consistent action packages, hinged on how Hunt and the IMF crew aren't infallible or guaranteed success; a vehicle chase through Paris gives the one in Ronin a run for its money. Naturally, Tom Cruise remains solid as a rock in the role of Hunt, handling the unpredictable aspects of both the stunts and Hunt's loss of control and inferiorities. Much like its central characters, Mission: Impossible - Fallout isn't a faultless blockbuster, attempting to become a little too impossible with its crowd-pleasing pursuits and franchise callbacks in the final act. The escalation may be impressive, revisiting helicopter theatrics against the wide expanses of mountain ranges while parts of The Apostles' plan hang in the balance, but McQuarrie loses some of his control over the action by also attempting to juggle the reappearance of old faces and making sure everyone involved has something meaningful to do in the climax. 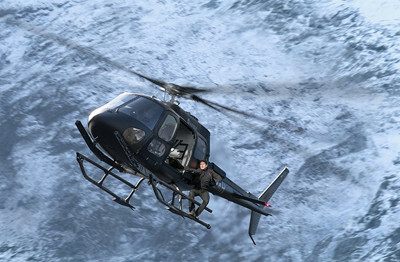 When the practical effects and Cruise's navigation of ‘em are occupying the screen, Fallout impresses; however, once those scenes transition to digital wizardry and rely too heavy on last-second happenstance, they shift into outlandish territory that pushes the limit of even Mission: Impossible's flexible credibility. Regardless of how it skids to the brink of plausibility, however, McQuarrie's latest installment rarely isn't entertaining, a fitting representation of a franchise that's succeeded in its mission for over two decades now. 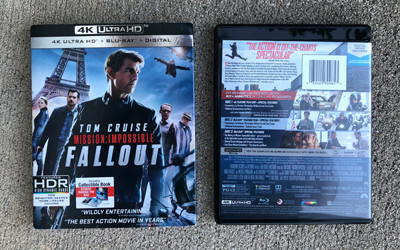 Mission: Impossible - Fallout crashes into the 4K UltraHD zone in a standard multi-disc package, with Disc One being the 4K offering, Disc 2 being an identical Blu-ray version of the UltraHD stuff and Disc 3 housing all the extras. Neither are exciting, lacking disc artwork when housed inside the standard black case, but a nice slipcase duplicates the front and back covers. 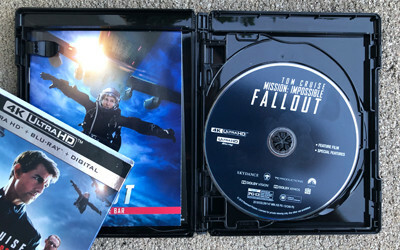 A Digital Copy slip sits atop the left-side disc. 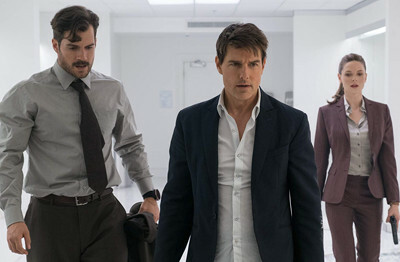 Mission: Impossible - Fallout also appeared at IMAX with an expanded aspect ratio for certain sequences, and I'm sure veterans of the home-video format probably know where this is headed: the cinematography moves between a standard 2.39:1 aspect ratio and a 1.90:1 framing for IMAX content. A debate has been around since the release of The Dark Knight's Blu-ray as to whether the aspect ratio should be kept in a locked position or shift to 1.78:1 based on the material (which expanded to the near-square ratio in IMAX theaters), or whether even the choice should be there between the two; however, this one falls into another category because the shifts in ratio genuinely reflect Christopher McQuarrie's intended aspect ratios for those scenes. Are the shifts distracting? They can be during the second of two notable instances of IMAX ratios, as the flips between the wider and slimmer framings are frequent. Luckily, the quality of those wider scenes makes up for it, because this is an impressive 4K transfer. Similar to Rogue Nation, Fallout's color scheme tilts darker and warmer during many interior and nighttime sequences, presenting a challenge to Paramount's grasp on HDR contrast balance. They're up to the task: shadows are rich and engulfing, but don't cancel out necessary details and only serve to elevate the depth of the image throughout. Scenes in clubs, through underground tunnels and safehouses, and against a dusk sunset are beautifully natural. Daytime sequences and more brightly-lit scenes (such as the bathroom brawl) are cleaner and brighter, of course, and those are the ones that emphasize impeccable detail in stubble / facial hair -- including Henry Cavill's amusingly unnecessary mustache -- as well as garments, sharp metal, and coarse rocky surfaces throughout the mountains. The IMAX ratio scenes are of the same quality as the rest of Fallout; no jumps in clarity or contrast strength based on differing formats. Capped with brilliant grain presence, this is a fantastic 4K UltraHD transfer. 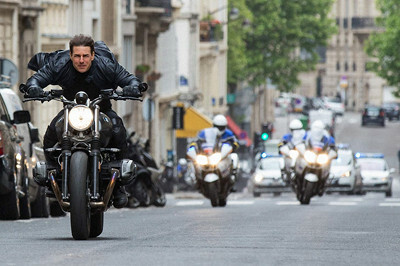 The fine-tuned machine of the Mission: Impossible franchise predictable sounds tremendous through its Dolby ATMOS 7.1 track as well, with several unique instances to flex the audio's muscles throughout. Naturally, the thuds of hand-to-hand combat, the pop of firearms, and the stage-filling blast of explosions hit all the right notes, and the object-based sound offering do an impeccable job of adjusting to level demands and telegraphing the action with crispness and low-end vigor. Certain other effects are where the track stood out to me: the spread of house music in a huge club environment has to capture both the echoic clarity and the muffling hard-to-hear levels of voices, which it does impressively; the hard rushing and subtle bubbles of being submerged in water are incredibly convincing; the hissing compression of oxygen and the clap of lightning are sublimely sharp; the revving of numerous types of motorcycle engines and the rush of large-sized bullets from a machine gun hit phenomenal midrange clarity. The surround responsiveness is top-notch, too. Mission Impossible: Fallout delivers on its action-movie sonic promise and comes equipped with a few pleasing surprises as well. The only extras available on the 4K disc itself are audio-based, but boy, are there some options there: three Audio Commentaries and an Isolated Music track. The first commentary features Director Christopher McQuarrie and Tom Cruise, and it becomes obvious early in the discussion how much impact Cruise has on the creative aspects of the rebooted MI universe, in which he suggests and follows what certain fans have asked of the emotional aspects of the story -- what needs "closure" -- and how they work that into the blockbuster plotting. They quickly emphasize something that's very important to me personally when filmmakers are working on sequels: the importance of how the film stands on its own, and how much they lean on objective knowledge of the earlier films in crafting the story. I know this might seem obvious, but the bulk of this commentary comes from the enthusiastic perspective of Cruise and responds to his personal input as McQuarrie "tells the story"; whereas the track with McQuarrie and Editor Eddie Hamilton attempts to be more neutral and objective with their observations, touching on included recorded lines, working around CG necessities, and full swaths of material that had to be cut for the sake of pacing. And there's a third commentary from Composer Lorne Balfe, which admittedly turns dry and drawn out at points when he isn't tying in personal anecdotes. While the first Blu-ray disc duplicates the commentaries and isolated track with nothing else include, there's Disc 3 lying in wait with a half-dozen extras in HD ready to do. The first is a slate of semi-connected featurettes under the Behind the Fallout (53:32, 16x9 HD), which merges cast/crew interviews with extensive behind-the-scenes footage. A slow and generic introduction to the crew and characters in Light the Fuse moves into Top of the World, which begins a pretty thorough dissection of the Halo jump sequence and its numerous moving parts, both preparatory and in execution. The Big Swing touches on the creation of a deleted scene mentioned in the commentary; Rendezvous in Paris covers the dangers of the chase through the city and how they emulated a short film; The Fall tackles a rather extreme stunt that might seem inconspicuous during the film itself; The Hunt is On centers on a helicopter sequence and the practical challenges; and the Cliffside Clash lands on the finale's penultimate sequence and final big action bit. Paramount have also thrown in a Deleted Scene Montage (3:41, 16x9 HD) -- including the big one referenced in the commentary and featured in the Behind the Fallout ledger -- as well as a Foot Chase Musical Breakdown (4:45, 16x9 HD) that focuses on the score involved with a lengthy and complicated scene of Tom Cruise doing lots and lots of his signature running, and a little bit entitled The Ultimate Mission that waxes poetic about how special this film was to make. We've also got a series of four static Storyboards and a Theatrical Trailer (2:33, 16x9 HD). Every entry in the Mission: Impossible franchise after J.J. Abrams' M:I-III has been a step up in quality above the rest of the series, even in comparison to Brian De Palma's first effort, yet there's always something keeping the Tom Cruise vehicles just a step or two away from reaching greatness. They're tremendous entertainment, impressive from a technical standpoint, and outwardly but satisfyingly expressive in terms of Ethan Hunt's network of partners. Fallout lands at about the same level of quality as the previous two entries, containing marginally superior -- read: excellent -- action and a step back in terms of screenwriting substance. In its efforts to bring together old faces and tie up loose ends in the franchise's mythos, both for characters and for conflicts, it relies on perfunctory retrieve-the-nukes plotting and fairly unsurprising twists in the espionage to keep the machine moving without being a distraction. That missing piece of narrative substance is all that's keeping this exhilarating, perceptive, and smartly-crafted blockbuster from reaching that top shelf. It'll have to settle for being damn good. Paramount's 4K UltraHD presentation looks and sounds phenomenal in its representation of the IMAX experience, and comes loaded with a slew of commentaries, featurettes, and other goodies. Very Highly Recommended.